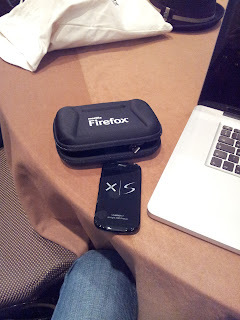 Let's begin with the eagerly awaited Firefox OS. Starting the debugger in Firefox OS has gotten way easier. There is a toggle in the settings app that will set or reset the devtools.debugger.remote-enabled pref, so that you don't have to mess with files and adb at all. At least for production builds that have marionette disabled by default. Developer builds will have to keep disabling marionette for a bit longer. 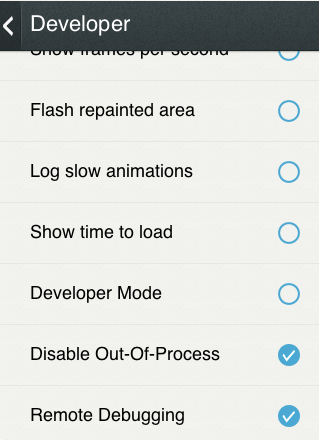 You can find the Remote Debugging toggle in Settings -> Device Information -> More Information -> Developer. Note that you will have to reboot the device (or restart the b2g process) for the change to have effect. Also, as you can see in the screenshot, it's a good idea to disable out-of-process support while debugging, at least until the debugger can support it. Speaking of desktop Firefox, the amazing Victor Porof has landed an obscene number of patches in the last few weeks, with many fixes and tweaks for the debugger frontend. Of those I'd like to highlight the new functionality to search for variables in the current scope chain while the debugger is paused. Prepend your search with a star to search in the variables view. When you deal with large objects with long scope chains, finding the variable you are looking for can be like searching for a needle in a haystack. Now it's a piece of cake. 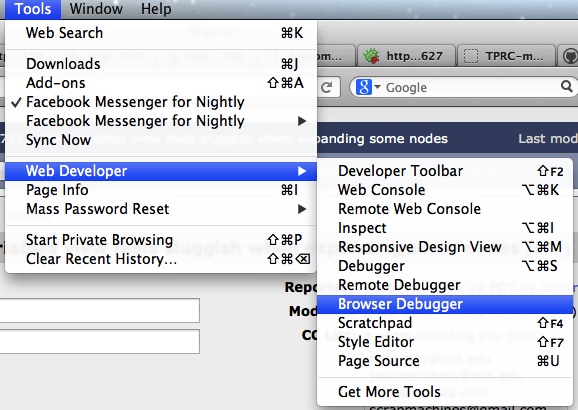 And last, but certainly not least, chrome debugging support has appeared in Nightly this past weekend! This will make debugging add-ons or Firefox itself way easier than ever before. You will need to enable remote debuging (devtools.debugger.remote-enabled) and browser chrome debugging as well (devtools.chrome.enabled, the same pref you switch to get Scratchpad to run against chrome). This will get you a nice new Browser Debugger menu item in the Web Developer menu, which launches a separate debugger process to inspect your browser instance. There has never been a better time to dive into Firefox internals and become a valued contributor. Take a look at this bug, to see how simple debugging has just become. Help us make the web better, by improving the lives of more than 400 million users! This week I had the opportunity to attend JSConf. I've been trying to make it to one of these conferences in the past without success and I now realize I was missing a lot! Chris and Laura Williams deserve special credit for the excellent job they are doing here. Even though I missed all the parties (because jetlag), the venue, the speakers, the tracks, and the conversations were all top class. Highly recommended. The B2G phones given out by Mozilla to all attendees, a gesture that sparked the creativity of quite a few people, culminating in a few B2G apps after a few hours of hacking. Yes, it's that easy. The chance to meet and listen to Dan Ingalls, in my humble opinion one of the greatest programmers of our time, giving his inspirational talk on the Lively Kernel. It would be a failure of our profession if the ideas in Lively Kernel do not find a way to reach mass market at some point. This system, like its predecessors Squeak and Dynabook, represent a more humane way of programming computers that could be a game changer. My own Debugging B2G talk was well-attended, even though a malfunctioning video cable threatened to kill it before it even began. I received lots of comments afterwards and requests for access to the debugger build that I demoed, and even though I pointed people to the patches, I think that the best thing to do for those interested is to wait a few more weeks, until we get all of that work in nightlies. After getting back at the hotel I recorded a screencast of the talk for those who couldn't attend, but unfortunately you will miss me mumbling while frantically plugging and unplugging a video cable and cursing at thunderbolt ports. Hands down the highlight of the talk. All in all it was a great opportunity to meat people, have conversations on the present and future of Firefox developer tools and ride a bull. Too bad I missed that last one.